Does Hard Work Lead to Success? The idea that hard work leads to material success is no longer, if it ever was, a uniquely Western value. 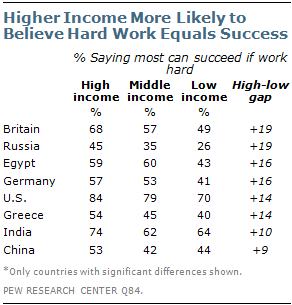 Half or more in 13 of the 21 nations surveyed believe that most people can succeed if they are willing to work hard. This includes Pakistan (81%) and the U.S. (77%). It also includes Tunisia (73%), Brazil (69%), India (67%) and Mexico (65%). But faith in the work ethic is particularly weak in Lebanon, where only 32% of the public anticipates rewards from hard work, and in Russia (35%), Japan (40%), Italy (43%) and Greece (43%), all countries that have suffered greatly from the recent economic downturn. 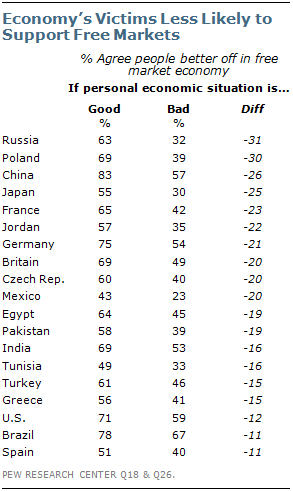 There is also little confidence in hard work in China (45%), despite the fact that it has economically outperformed every country in this Global Attitudes survey. The Germans are beneficiaries of a relatively strong economy in recent years and the people most other Europeans think are the hardest workers in Europe (See the recent Global Attitudes report “European Unity on the Rocks,” released May 29, 2012). But Germans are divided about the value of hard work: 51% think hard work leads to success, 48% think it is no guarantee. West Germans are more likely to believe in the rewards of labor than are East Germans, who have in recent years experienced higher unemployment than their western counterparts. Those who have had personal economic achievement in life tend to believe that hard work leads to success. High income individuals, especially in Britain, Russia and Egypt, are significantly more likely than low income earners in those countries to say most people can get ahead if they apply themselves. However, there is no meaningful difference in such attitudes between the rich and the poor in Brazil, Turkey and Tunisia, where half or more of the population values hard work whatever their income. Meanwhile, people facing hard times in Europe and Japan, but notably not elsewhere, have lost faith in the work ethic. Half or more of those who say their personal economic situation is not good also think hard work is no guarantee of success in Japan (65%), France (63%), Germany (62%) Britain (53%), Greece (53%), Poland (53%) and the Czech Republic (52%). Notably, however, in most countries outside the industrial world the work ethic has not lost its appeal, even among those who are suffering economically. In Egypt, Jordan, Tunisia, India, Pakistan, Brazil and Mexico, half or more of those who say their personal finances are not faring well still believe that hard work can bring economic success. Faith in capitalism is another victim of the Great Recession. In just 13 of the 21 nations surveyed, half or more agree with the statement that people are better off in a free market economy even though some people are rich and some are poor. Support for capitalism is greatest in Brazil (75%), China (74%), Germany (69%) (although East Germans are less supportive than West Germans) and the U.S. (67%). The biggest skeptics of the free market can be found in Mexico (34%) and Japan (38%). But in nine of the 16 countries for which there is trend data since 2007, before the financial crisis began, support for capitalism is down, with the greatest declines in Italy (down 23 percentage points) and Spain (down 20 points). In the U.S. and in four of the eight European countries surveyed, men are more likely than women to think people are better off in a free market economy. There is similarly disproportionate male support for capitalism in Turkey and Tunisia. And in 12 of 18 countries, people with a college education are more likely than those without a college degree to back the free market system. The link between the work ethic and support for capitalism, discussed by German sociologist Max Weber, is borne out by the survey. In 14 of 21 countries, those who have faith that hard work leads to economic success are also more likely to think people are better off in a market economy. This is particularly the case in Britain, U.S., Russia, the Czech Republic and China.